After Apple revealed OS X Mavericks today at WWDC, the company went on to announce a totally redesigned and highly anticipated iOS 7. Compatible with the iPhone 4, 4S and 5 including the iPod touch 5 and iPad 2, 3, 4 and mini - iOS 7 is as majestic as we've imagined it to be and it'll be ready for us all this fall. Simplified to the utmost extreme, iOS 7 features a completely new and much simplified lock screen which features direct access to a new feature called Control Center by swiping up from the bottom at any given moment and place. The same can be done to bring up Notification Center by pulling down from the top. The user interface has been revamped with smooth transition animation and sleek typography that'll satisfy just about every existing iOS user and Apple fanperson. Control Center gives you quick access to a handful of useful settings like Bluetooth, WiFi, brightness among other most used tools notably AirDrop. Which is yet another new feature brought from the Mac platform that lets users share photos, videos and more with one another wirelessly over Bluetooth or a WiFi connection - without having to physically "bump" phones. Apple is winking at Samsung there. Another improvement is multitasking. Pressing the home button twice brings up a real-time card view preview of opened apps instead of simple app icons similar to what webOS introduced. Swiping away a preview card instantly closes that particular running app. 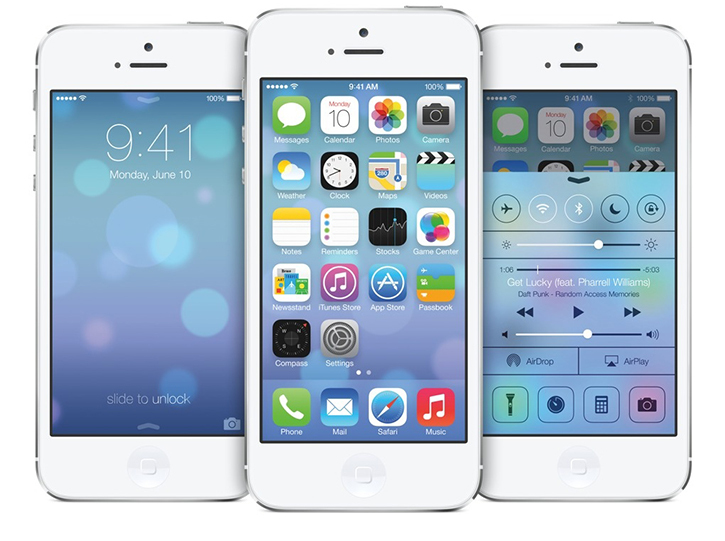 iOS 7 updates your apps behind the scenes in a more efficient matter that saves battery life. The new design uses clean, semi-translucent interfaces and background blur to visually present a simplified experience featuring a modern minimalist color palette that is also affected based on the wallpaper you've set much like when using Launchpad on OS X. It's the prettiest iOS no doubt about it. There's even more visual candy in iOS 7 including a somewhat trippy detail effect in an extremely cool way - that uses the built-in accelerometer to change the prospective of the icons relative to the background which allows you to virtually see behind the icon as you tilt and move the iPhone around in space to essentially create a sense of dimension to what was once a mundane homescreen. It also looks like live wallpapers will be another little feature to be included which hasn't been talked about. An improved and of course also redesigned Siri has also been added to the set of improvements with a new, more natural sound speech you can configure to female or male. In iOS 7, Siri is quicker and checks more sources including Twitter and Wikipedia. Furthermore, Apple announced that Siri and iOS 7 will be integrated into the car's built-in display of select car manufacturers. Icons have kept their original iconic rounded-off shape but were given a smooth, flat design that is more minimalist in character. Notice that even the status indicator for the signal strength has been redesigned to indicate reception levels using a series of 5 dots. Conversely, the WiFi icon and small time indicators have remained untouched. Of course there's a bunch more features to explore, so do yourself a favor and check out all of it on Apple's dedicated iOS 7 overview page.